In this blog I write about systems. What’s tricky here is that systems — two or more parts that interact to form a whole — are often hard to see. If you think of it, have you ever seen a system walking around? Why not? Well, for the most part we don’t actually see the connections that make up systems. We have to imagine how this influences that. I was reminded of this during yet another snowstorm last week. With school closed, my two boys were having a ball, and then, as the afternoon crept in, the laughing was replaced by arguing. 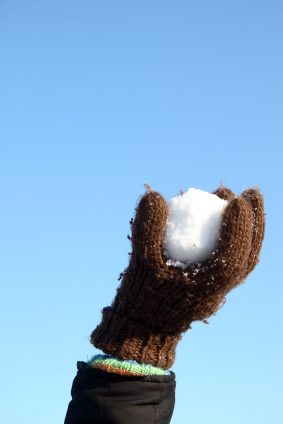 What started out as a sharp word or two, ending up in a not-so-playful snowball fight. Was this simply too much of good thing? To find out, I took each one aside, and listened while each told their version. When I asked: “Would you say this is what’s going on?” they both agreed immediately but then quickly started talking over each other. “Look,” one of them said, pointing to the diagram, “it’s a figure eight lying on its side.” The symbol of infinity. “This thing could go on forever,” one moaned. “And just keep getting worse,” the other groaned. 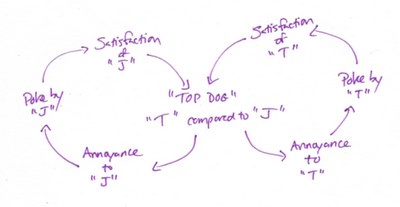 As we talked about it, the growing conflict was driven by each one trying to “out-cool” or “top-dog” the other. The more “cool” behavior one kid put on, the more the other wanted to squash it. As it turns out, one was particularly good at “poking” and the other one was good at “squashing”. For that one snowy afternoon (with their Mom at her wit’s end), they saw themselves as part of the “system”, rather than separate from it. They “got” that focusing on just one of them wasn’t going to solve the problem. When they could see how their actions were actually fueling the actions of the other (with the help of a simple picture) they then were able to talk about how they might break the cycle. When I asked what they could do differently, the answer came easily. The poker would lighten up on the poking, and the squasher wouldn’t squash so much. When our children learn to see systems they eventually learn to see themselves “in” and not outside of situations. When they see that nothing stands alone, they begin to see that my bully is your bully, your food shortage is my food shortage, my climate is your climate. They learn to stop jumping to blame a single cause for the challenges they encounter and instead, try to track the a variety of interacting causes, effects and unintended impacts. They learn to move beyond laundry lists and look for more web-like patterns of cause and effect in their everyday lives. Does all of this really happen when we talk to our children about systems? We’re expecting another snow day this week. I’ll let you know how it goes.